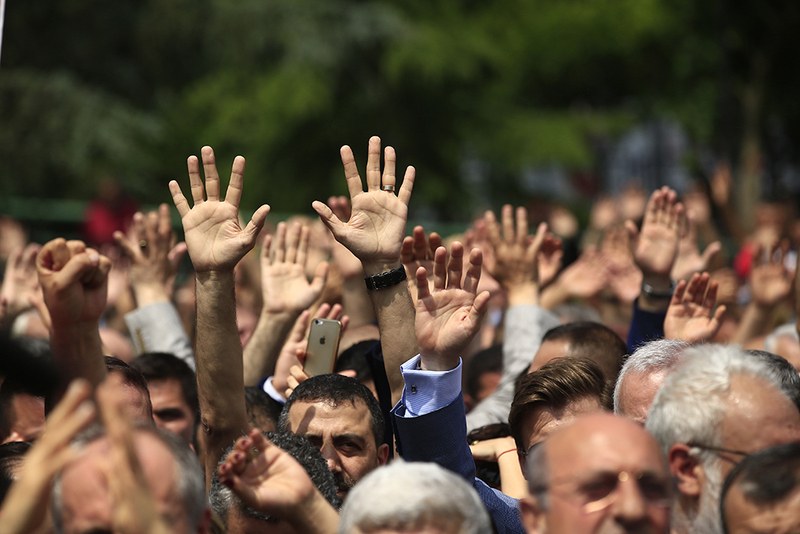 Supporters of Turkey's pro-secular Republican People's Party (CHP) wave their hands and chant slogans as they gather for a protest in Istanbul, June 15, 2017. Despite tremendous government pressure, Turkey’s vibrant civil society has the potential to help the country confront deep political and social problems. Turkey today is riven by internal polarization and is increasingly estranged from the West. The country faces serious social, economic, and political challenges—particularly a deep division between supporters and opponents of the current government and its more religious, nationalist, and populist agenda. The governing party has undermined checks and balances and consolidated power in a disturbing way, and has aggressively pursued its political agenda with little attempt to seek consensus or include stakeholders from across Turkey’s diverse society. In this environment, with formal politics relegated to relative insignificance by the majoritarianism of the current government, civil society becomes increasingly important. Civil society offers one of the few remaining checks—however weak—on government overreach. Civil society activists can help address pressing social problems and provide reservoirs of knowledge that can be tapped when political conditions improve. Participation in civil society groups can bridge Turkey’s deep ethnic, religious, and social divisions, and such activity has been shown to help reduce societal tensions and increase ethnic tolerance. Finally, civil society groups provide connective tissue to Europe and the West at a time when such connections have been frayed. For all of these reasons, Turkish civil society deserves support from those who believe in a participatory, democratic future for the country. This report describes the importance of Turkish civil society and provides historical, political, economic, and legal context for its operation. It addresses the ongoing purge of some civic actors and examines the polarization that continues to divide civil society groups (CSOs) despite their shared predicament. Looking at the major challenges facing Turkey as a whole, the report offers examples of how CSOs can contribute to solutions across the board. Finally, it offers recommendations for how best to support Turkish civil society. Why focus on civil society? To some observers of Turkey’s politics and ties with Europe and the West, it might seem incongruous to focus on trends in civil society at a time of such astonishing upheaval. Turkey is in the midst of a deep, prolonged political crisis and is beset by internal and external security threats. The brutal civil war in neighboring Syria and ongoing turmoil in Iraq have elevated social tensions, sparked renewed conflict with Turkey’s sizable Kurdish minority, crippled trade ties, and brought millions of refugees into the country, increasing the demands placed on state resources on multiple fronts. The nation’s economy continues to sputter, with structural reforms required to avoid the middle-income trap and unlock the next stage of growth needed to employ a growing population.1 Alongside the threat of the middle-income trap, Turkey is facing what some have dubbed a “middle-democracy trap.”2 A marathon series of elections in 2014 and 2015 elevated political tensions and disrupted parliamentary politics, capped off by the controversial April 16, 2017, constitutional referendum, which stands to transform Turkey’s government and political system in the coming months and years.3 These high-stakes political contests have exacerbated an already pronounced drift away from democracy by the governing Justice and Development Party (AKP) and its leader, President Recep Tayyip Erdoğan. Recent years have seen Erdoğan and his party assert greater control of the judiciary, undermine checks and balances, stifle criticism, jail journalists and political opponents, shutter critical media outlets, and violently suppress public demonstrations. The coup attempt of July 15, 2016, and the ensuing state of emergency and crackdown on political opponents represent the culmination of this remarkable period of upheaval. The Turkish government blames the coup attempt on elements within the military and state bureaucracy loyal to Fethullah Gülen, an exiled religious leader who built a social movement founded upon a network of schools and nongovernmental organizations. Gülenists, as his followers are called, are close former allies of the AKP, and are now accused of infiltrating the state apparatus and the judiciary and, eventually, plotting to overthrow the AKP government. This report is part of the Turkey 2023 project, an effort to outline a long-term prosperity vision for Turkey, explore the nation’s role in Europe and the transatlantic relationship, assess the state of the republic and its institutions 100 years after its foundation, and examine its position in the region and in the world. The project is centered around an expert trilateral task force assembled by the Center for American Progress in Washington, the Istanbul Policy Center in Istanbul, and Istituto Affari Internazionali in Rome. It is funded by Stiftung Mercator, a nonpartisan German foundation. The task force brings together respected scholars and practitioners several times a year for discussions on the challenges of inclusive growth, regional crises, and global relationships, including prospects for European Union membership and global integration. The findings and recommendations from these workshops are compiled into policy papers and presented at public events and private briefings to government officials and relevant nongovernmental organizations. More information is available on Twitter and Medium.com via @Turkey__2023. This particular report is the product of several research trips to Turkey and working group meetings between the task force and an associate group of civil society experts, as well as dozens of calls, meetings, visits, and email exchanges with civil society practitioners and academic experts in Turkey and the EU. The authors are very grateful for the time and expertise granted by so many experts and leaders, often in very trying circumstances. The core working group and civil society expert group—separate from the groups and people interviewed for this report—are listed below. While this paper leans heavily upon the input and scholarly research of this group of experts, it does not necessarily represent the consensus views of all of the members and is attributable only to the primary authors of this report. For the purposes of this report, civil society is defined as those organizations and movements that are not of the government or its related organs, not businesses, and not formal religious institutions. Many of Turkey’s civil society organizations (CSOs)—though not all of them—are registered under the Associations Law and the Foundations Law, the primary pieces of legislation most directly affecting civil society organizations. Because the normative framework of the Turkey 2023 project includes a commitment to Turkey as a part of Europe, this report focuses primarily on those CSOs that are most politically relevant to Turkish democracy and its ties to Europe and the West, namely: rights-based groups; advocacy groups focused on issues of democracy, rule of law, and reducing political and social polarization; groups focused on serving or advocating on behalf of disadvantaged groups; and CSOs working to address the major challenges to Turkey’s stability, including Syrian refugees, women’s rights, Kurdish peace, and climate change and environmental degradation. Less emphasis is placed on professional and trade associations, sports clubs, unions, and universities, except in terms of their potential to bring together diverse segments of society in depoliticized settings, potentially offering venues to improve tolerance and teach active citizenship. A note is necessary here regarding the blurred lines of civil society activity. There is substantial controversy in Turkey associated with referring to Kurdish and Gülenist civil society organizations, as some groups in both categories undoubtedly have—or had—parallel political organizations and had in some cases worked to build a presence within the state. But, equally, both groups likewise channeled grassroots civic activism and formed CSOs that meet the definition above, and Gülenists had long represented some of the best-financed and organized civil society actors. Likewise, most sectors of civil society—whether it be Kurdish, secular, religious conservative, or nationalist—have had ties with political parties or movements and have at times sought to gain influence within the state apparatus; references to Gülenist civil society, in particular, should be considered in this context. Given this fraught political and strategic context, is a focus on Turkish civil society and its ties to Europe warranted? In a word, yes. Despite the official crackdown and the climate of uncertainty that prevails among civil society actors, Turkish civil society remains active and relevant. With respect to nearly all of the major challenges facing Turkey—integrating and educating Syrian refugees, reducing ethnic tensions, improving educational outcomes, combatting radicalization, and bringing more women into the economy—CSOs are leading efforts to find solutions. Turkey can be strengthened by a renewal and reopening of civil society activity. Likewise, civil society offers a way to continue discussing and working on the sensitive issues driving Europe and Turkey apart at a time when formal bilateral relations and high-level politics are extremely negative. Therefore, officials in the EU, Germany, and the United States have both interest-based and normative reasons to focus on civil society in Turkey. Because this focus and support is aimed at strengthening democratic practice and transparency, it should itself be transparent; this openness helps insulate such assistance against charges of foreign intervention in Turkey’s domestic politics. Turkey is unlikely to be a reliable partner over the long term absent renewed democratic progress or—at a minimum—a lowering of political, ethnic, and social tension. The Turkish government has taken a series of actions over the past six years that have weakened its democratic legitimacy and therefore its ability to arbitrate disputes, particularly across the stark ethnic and political fault lines of Turkish society. Given its recent rhetoric and the political realities of the right-wing alliance between the AKP and the Nationalist Movement Party (MHP), it seems unlikely that the government will abandon this polarizing approach in the near term. Taken together, this means that initiatives to rejuvenate political dialogue and reduce tensions may have to originate from civil society. Similarly, with the governing party set on a course of suppression and majoritarian rule, and with European politics suffering through a particularly virulent right-wing populist wave, leaders on both sides committed to maintaining Turkey’s ties to Europe and the West should focus on preserving the muscle memory of democratic practice within Turkey and the connective tissue between Turkey and Europe. Again, on both these fronts civil society is the primary venue for helpful activity. Furthermore, in Europe there may be a need for policymakers to pledge their support to people committed to European values and the European project, and to speak up on behalf of the most vulnerable. This would back up the EU’s claim to be a relevant soft-power entity. Civil society is also more important than ever given the erosion of checks and balances and the lack of effective opposition to the governing party’s majoritarianism. There has been a rise of mass movements and political foment outside formal organizations or institutions. There is substantial activity—extremely difficult to track—among informal religious networks and unorganized civic activists. Surveys of young Turkish citizens show that they are far more interested in expressing their political views through civil society—which is often highly informal—than through formal political parties, in which trust is falling. In the mainly Kurdish southeast, civil society institutions and initiatives have suffered heavily from state repression and the violence of the Kurdistan Workers’ Party (PKK) since the resumption of the conflict between those two parties, a conflict that has displaced 500,000 Turkish citizens, mostly of Kurdish descent.12 But this does not mean civic organizing is disappearing; it is just becoming more informal and less institutionalized. It would be unwise for either the government of Turkey or its partners abroad to ignore or stifle this often highly polarized civic pressure; driving this activity underground will not make it go away but may harden antagonistic positions. A more open approach could bring meaningful benefits to Turkey, both at home and abroad. As mentioned previously, civil society organizations have the capacity to help tackle Turkey’s most urgent problems: Witness the very effective civil society response to the Syrian refugee crisis. Civil society has the power to shape public opinion. While the government has come to view the free flow of information as a threat, isolation will only result in Turkey falling behind its international competitors economically and losing cultural and political soft power. Turkish civil society has become increasingly proficient at delivering social services and humanitarian assistance, which can boost Turkey’s influence abroad and reduce government obligations at home. Throughout Ottoman and Turkish history, civil society has struggled to escape the weight of strong central government. In many ways, the Ottoman Empire—particularly in its latter years—gave more space to civil society than did the early republic, from its 1923 founding. The former, which asserted commitment to Islam as the basis of its legitimacy, usually gave full scope to Sufi brotherhoods and the craft guilds that were often associated with the brotherhoods, as well as a system of untaxed religious foundations—vakıf, plural evkaf—that often carried out important economic and social functions but were not seen to threaten the state.13 The Republic of Turkey, with its focus on secular-based social engineering, diminished the scope for civil society development, which remained the case essentially into the 1980s. A slight blossoming of civil society in the last years of the Ottoman Empire—nearly 40 women’s associations emerged during this period—withered with the emergence of the republic.14 Neither the empire throughout most of its history nor the early republic was hospitable to the notion of politically focused civil society. During the years that the republic’s founder and first president Mustafa Kemal Atatürk was in office, 1923–1938, what little civil society existed was essentially state-sponsored. Most notable in this regard were the Halkevleri, communal organizations designed to spread the philosophy of the new state. Sufi brotherhoods were formally abolished in 1925, although they continued to exist extra-legally, and control of most religious foundations was assumed by the state. Nevertheless, the election of Turgut Özal as prime minister and the return to civilian rule in November 1983 ushered in an era of greater political and economic openness in Turkey, which ultimately produced the budding of autonomous civil society groups in the remainder of the 1980s and 1990s. Over the roughly two decades from 1983 to 2004, the number of NGOs in Turkey tripled.19 Some of the noteworthy groups founded during this period include the Human Rights Association, established in 1986 and focused on civil rights abuses in Turkey, especially in the mainly Kurdish southeast; the Human Rights Foundation, founded in 1990 to support victims of torture; Mazlumder, a human rights group established in 1991 and inspired particularly by concern for religious and impoverished Turkish citizens; the Mesopotamia Cultural Center, founded in 1991 to promote Kurdish language and culture; ARI Group, a secular group established in 1994 to promote democracy and good governance in Turkey; Araştırma ve Kurtarma Dernegi, or Search and Rescue Association, which was founded in 1996 and won high praise for its efforts in the aftermath of the deadly August 1999 earthquake; and KA-DER, a women’s empowerment group established in 1997. The accomplishments of Araştırma ve Kurtarma Dernegi after the earthquake, as well as the performance of other civil society groups, significantly raised public awareness—“a turning point,” according to one author20—about the growth, importance, and potential social value of voluntary civil society organizations. The expansion of identity and religious politics during this period also helped to galvanize the growth of civil society. Religious groups founded numerous charities and other institutions, including hospitals and universities. The so-called Gülenist movement—formally known as Hizmet—founded a number of these. Meanwhile, numerous Kurdish civil society groups sprouted in the mid-1990s, particularly in Turkey’s southeast, spreading Kurdish consciousness even as Turkey’s war with the PKK was winding down—temporarily, as it would turn out.21 As with the other groups cited above, some of the Kurdish civil society organizations were formally registered under the Associations Law, marking a breakthrough for Turkey, which had long denied the very existence of Kurds as a separate ethnic group. Some other important groups were not registered, however. This new and more open environment was inherited by the AKP when it came to power in November 2002 and expanded by the new government to include greater space for religious and, eventually, Kurdish civic activity. State control and suspicion of civil society, with its roots in the Ottoman and early republic eras, had not ended, but the reins had been decidedly loosened. Turkish citizens, meanwhile, increasingly had come to see civil society formation more as a right than a privilege allowed by the ruling authorities. The pace of societal change in Turkey over the past two decades has been astonishing, and Turkish civil society has reflected those wider changes in the country. There has been a roughly 50 percent increase in civil society organizations’ membership and activity since 2000, driven by Turkey’s economic boom and further integration with Europe. Today there are nearly 130,000 CSOs in Turkey, and roughly 13 percent of the Turkish population is a member of an association—the most common legal status for CSOs.24 Despite the shuttering of 1,500 CSOs in the wake of the July 2016 coup attempt, there is still tremendous diversity, complexity, and capacity among Turkish civil society. To better understand the context in which Turkish civil society organizations operate, it is important to examine the legal framework governing their operations, the political realities that underpin that legal framework, the economic challenges and opportunities that CSOs face in Turkey, and the norms and societal expectations that shape civil society and CSOs’ interactions with the public. Turkey’s history, social norms, and legal framework reinforce the primacy of the state, a situation that has often led to a restrictive or uncertain environment for civil society. Turkey is governed by a constitution drafted in 1982, when the country was still under military rule. While the constitution has been repeatedly amended and various reforms have been undertaken, there remain a number of vague or open-ended articles that allow the state great leeway to dominate public discourse and activity. This is clearly visibly in the laws governing associations and foundations—the two primary legal entities for CSOs—that cover the collection of donations, tax exemptions, and fundamental rights and freedoms such as the right to free assembly and expression. 26 As noted previously, reforms to allow for greater public expression and civil society activity gained momentum in the 1990s.27 However, civil society activity really took off after Turkey officially became an EU candidate country in 1999.28 The AKP, newly elected in 2002, defined itself largely in opposition to the secular establishment that had long governed Turkey, and the party had ample recent experience of repression of social and political activity. The new government also feared a military coup and/or judicial steps to ban the AKP from politics, a fate that had befallen previous parties seen as too religious by the secular establishment. The AKP in its early years also included some liberal reformist voices, and furthermore saw Turkey’s economic and political interests as best served by stronger ties with Europe. Civil society actors, particularly likeminded groups such as Mazlumder, which focused on equal treatment for religious Turkish citizens, were therefore largely viewed as potential allies. Likewise, the party sought to bring Turkish laws and practices in line with EU standards, both to pursue eventual accession and to insulate the government from antidemocratic overthrow—as had befallen the last Islamist government of Necmettin Erbakan. Despite this early progress—and despite the party’s own commitment to empower civil society and democratic participation—the AKP has increasingly fallen back on a narrower, more majoritarian, understanding of democracy, with elections as the sole source of legitimacy and a focus on “representation, not participation.”33 This overall deterioration translated into a pause and an eventual backsliding in the opening of the legal environment for civil society activity. The Gezi Park protests of 2013 are a clear watershed in this process. These nationwide urban protests against the government’s heavy-handedness in social life and the growing political repression and suppression of dissent ballooned into a genuine—if brief—mass movement. More than 2 million citizens in virtually every province in Turkey joined the protests. Previewing the majoritarian approach that has come to define him, then-Prime Minister Erdoğan rejected the legitimacy of the protests and pointed to the ballot box as the only legitimate mode of democratic participation.34 The protests elicited a brutal police response from the government, followed by a series of laws that—contrary to the party’s early reformist impulses—significantly strengthened the state’s ability to prevent and suppress protests, rallies, and mass movements. This 2013–2015 tightening of restrictions on political dissent and public activity only exacerbated an already vague and problematic legal and constitutional setup that has long provided the state with ample means to prosecute or suppress activities it deems undesirable. Despite the 2004 and 2008 improvements, provisions in the Associations Law and Foundations Law still prohibit any association “formed for an object contrary to the laws and morality,” any foundation “contrary to the characteristics of the Republic … or with the aim of supporting a distinctive race or community.”36 Numerous bureaucratic requirements imposed on associations and foundations provide many opportunities for selective enforcement, harassing inspections, damaging fines, and political deterrence of all but the most committed groups. Uncertainty and fear are perhaps the defining characteristics of the political atmosphere for civil society today in Turkey. The state-oriented and often vague legal provisions outlined above—along with the outright abuse, increasingly common in recent years, of both legal statutes and the judicial system—make the real political context for civil society substantially more negative and complicated. There have long been restrictions on activities around sensitive issues such as Kurdish identity, democracy and rule of law, and religion. But with a fractured state and a crackdown that has spiraled beyond the Gülenist groups accused of links to the coup and Kurdish groups swept up in the state’s response to the PKK, the traditional redlines have become blurred, and civil society organizations are uncertain what actions might elicit a state response. Even before the coup attempt and ensuing state of emergency, observers of Turkish civil society wrote of the “shrinking civic space.”46 This deterioration in the civil society environment tracked the overall erosion of the rule of law and democracy in the country to include increasing assertion of political control of judiciary; criminalization of dissent, including much more frequent prosecution of citizens for “insulting the president”; legal and extralegal suppression of the press; and politicized tax fines and closures of opposition groups.47 In other words, Turkey’s civic sphere was suffering even before the coup attempt and will continue to face deep problems even if emergency rule ends. Alongside the authoritarian moves of President Erdoğan, Turkey’s persistent, so-called Kurdish problem has long been a primary factor behind periodic deteriorations in democratic openness. Kurdish organizations have long been shut down on vague terrorism charges or through investigations for procedural violations such as poor record keeping—steps that members consider to be political retribution for their criticism of government policy.48 The situation dramatically worsened with the breakdown of the Turkish state’s ceasefire with the PKK in July 2015. The resumption of low-grade civil war has been accompanied by widespread displacement and a broader crackdown on Kurdish public life generally, bringing long-lasting blanket curfews to the mainly Kurdish southeast, widespread arrests of Kurdish activists and journalists—including those who have long publicly opposed the PKK’s violence—and an overall return to the old state approach in which many forms of Kurdish political and cultural expression are repressed. Most prominently, of course, with the support of the MHP and the Republican People’s Party (CHP), the AKP pushed for a removal of parliamentary immunity for lawmakers, a move that was aimed at HDP parliamentarians and that led to the arrest and detention of several on terrorism charges. Kurdish civil society groups were squeezed between the violence of the state and the PKK, and the most visible collapse of CSO activity was in the Kurdish region, where the return of conflict ended the flowering of civic activity that had been visible during the stable 2013–2015 period. The state of emergency has created widespread fear and uncertainty among civil society organizations and civic actors more broadly. Even under normal constitutional rule, CSOs face an uncertain environment in Turkey, and the state has many means of influence. In the chaos of the post-coup attempt environment—with normal politics suspended and emergency rule in effect—many civil society actors have severely limited their activities. Anecdotal evidence suggests that this has had the effect of pushing more activity underground and contributing to informal networks and quiet efforts to maintain civic space under the radar of extremely sensitive and hostile governing authorities. Beyond the remaining legal constraints on civil society activity and the more concerning de facto political situation in which civil society organizations operate, economic realities also profoundly shape the sector and determine the effectiveness of most groups. This financing imperative can itself become a political issue, of course, and can open up CSOs to pressure from outside groups and the government. This influx of capital from the EU and other external funders represents an important part of the economic context for Turkish civil society, but there is also the broader economic impact of the jobs and domestic activity that stems from civil society, as well as the human capital gained through trainings and exchanges organized by CSOs. 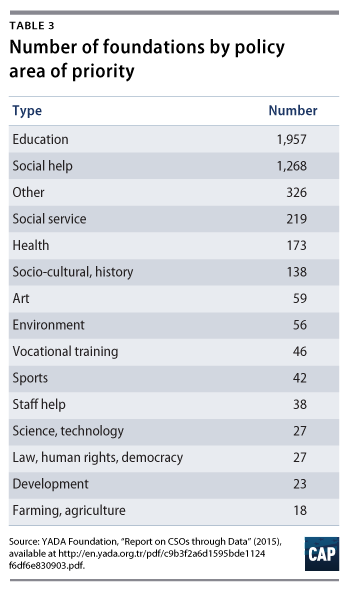 There were 51,000 official full-time employees at Turkish CSOs in 2015, but that excludes the much bigger pool of volunteers, part-time workers, and contractors that make up the bulk of the civil society workforce.63 Turkish CSOs spent close to €5 billion in 2013, including close to €700 million in employee salaries, and brought in almost €100 million in foreign donations.64 For a country struggling with sluggish economic growth and high unemployment, these are not insignificant figures. Furthermore, while civil society is too often viewed as a nuisance by the Turkish government, as noted previously, much civil society activity actually serves to ease the government’s burden by providing social services and humanitarian relief. Through dozens of interviews with civil society practitioners and academic experts from a broad range of backgrounds in preparation for this report, several consensus themes emerged regarding civil society in Turkey. Interviewees tended to regard the inhibitive legal, financial, cultural, and political environment for civil society outlined above as something of a given and most often pointed to the problem of polarization within and between civil society groups as a primary challenge to increasing the influence of civil society. There are exceptions to this polarization, of course, such as the cooperation of Mazlumder and the Human Rights Association—devoted primarily to advancing the rights of religiously devout and Kurdish citizens, respectively—who intermittently come together to advocate for a broader platform of democratization and human rights.75 Respondents also pointed to the occasional cooperation of women’s rights groups in coalescing around certain policy agendas despite approaching the issue from vastly different political vantage points—for example, secular versus Islamist. But these alliances remain the exception rather than the norm, with most organizations advocating for their narrow constituencies rather than advancing a broader cooperative agenda based around the public good. Indeed, many interviewees said that the concept of public interest has suffered as Turkey has become more politically polarized overall, with fewer tactical alliances and starker divides—for example, between Islamist women’s organizations and secular Kurdish women’s organizations. Many observers lamented the fact that CSOs have bursts of unity—as during the Gezi Park protests or the strong reaction to recent AKP attempts to quietly pass restrictive legislation on violence against women—but little ability to sustain or institutionalize it. 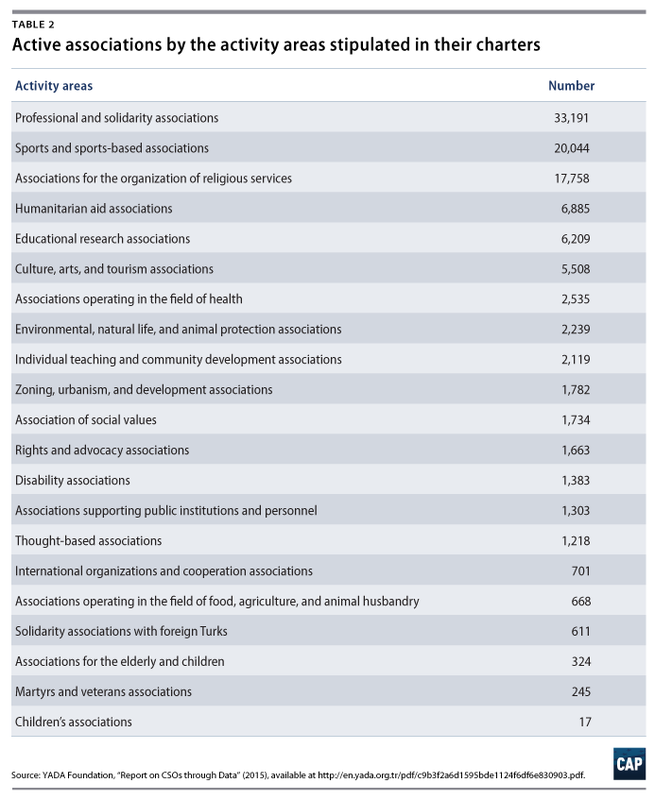 Civil society organizations favored by the government often enjoy “public benefit” status, meaning they have broad license to solicit tax-exempt donations. The government tends to favor CSOs to which it feels an ideological affinity; it also prefers service-oriented CSOs over rights- or advocacy-focused CSOs. Given this politicization, the organizations that enjoy public benefits status have shifted over the years; secular groups favored before the AKP have given way to new groups—which are often more religious—that share the government’s outlook. The Humanitarian Relief Foundation—better known by its Turkish acronym, İHH—illustrates this trend and is the most oft-cited example of both the government’s ideological angle and its preference for service-oriented groups. Prior to the AKP, an overtly Sunni Islamic charity that focuses on on-the-ground aid, like İHH, would never have enjoyed public benefits status. But today, despite recent tensions with the governing party, the group enjoys wide in-kind, de facto government support as well as the coveted tax-exempt status. The Women and Democracy Association is often named as another government-associated group—President Erdoğan’s daughter is the vice-chair—and receives access, promotions, and tax-exempt status from the government.77 President Erdoğan’s son is likewise a board member of the Service for Youth and Education Foundation of Turkey, which enjoys public benefits status as well and received just shy of $100 million in aid from abroad between 2008 and 2012.78 Groups like the Union of Chambers and Commodity Exchanges of Turkey, meanwhile, share the government’s interest in burnishing Turkey’s economic achievements, resulting in the appearance—if not necessarily the reality—of obeisance. These government-backed groups enjoy increased operational capacity and can do good work, but often lack legitimacy outside the AKP constituency, which limits their capacity to address some of the most controversial issues confronting the country. Many mandatory professional organizations, such as the Turkish Bar Association or the Union of Chambers of Turkish Engineers and Architects, exercise meaningful influence. These groups can sometimes demonstrate considerable independence; the Turkish Bar Association has been very outspoken on the erosion of judicial independence, for example, and the Union of Chambers of Turkish Engineers and Architects has spoken out against environmental degradation, including during the Gezi Park protests. But these groups often carry state-mandated membership—that is, you must be a member in order to practice that profession. While this can bestow power through mandatory membership and fees, it is also a liability as it makes them vulnerable to state interference through government steps to regulate the profession in question, which can squarely target these groups’ base of support. Furthermore, as umbrella groups comprised of many local branches, the national organizations can play host to political infighting among competing factions. Finally, there are the groups that suffer active repression at the hands of the government. Chief among these are Kurdish groups opposed to state policy—as compared with Kurdish groups that support the government, which face no problems—as well as the now shuttered Gülenist groups, liberal activist groups, and rule of law organizations. All of these groups are under tremendous pressure. The instrumentalization of CSOs for political purposes remains a major challenge, and it is not just the AKP that does this—all of the major political parties cultivate civil society allies. While it is neither possible nor desirable for all civil society groups to be nonpolitical, interviewees stressed the need for a more conceptual, rights-based approach to avoid civil society becoming subsumed by partisan or ethnic identities. The government’s efforts at suppression and ad hoc favoritism may be giving way to a new, more strategic approach. With the elimination of the Gülenist civil society groups—which had comprised much of the AKP’s civil society flank until 2013—the government may now be engaged in a proactive effort to establish and support new conservative CSOs to advance its goals. There is anecdotal evidence of this in several civil society fields—particularly in areas important to the AKP constituency such as health and education—but it is an area with little transparency and is thus deserving of further research. Given the history of instrumentalized civil society groups and positive and negative discrimination by the Turkish state, transparency—particularly on issues of public funds and tax exemptions—will be important in defining the sector and its credibility moving forward. Paradoxically, given this preference, Turkish civil society may have more success convincing the public of its value by addressing the first major problem—polarization—through efforts or platforms to reduce polarization in the country. Some civil society experts argue persuasively that CSOs provide venues for learning active citizenship—defined to encompass civic action, social cohesion, and self-actualization—and encourage democratic participation.82 The social cohesion aspect of civil society activity may prove particularly important in Turkey, given the deep social divides and low levels of public trust. Indeed, a 2016 study from the Istanbul Policy Center found a correlation between active citizenship—closely linked to civil society activism—and more positive views on different ethnic and religious groups.83 This is an important normative point: Civil society participation can help socialize concepts important to addressing Turkey’s most pressing challenges. Of course, beyond these broader normative points, Turkish civil society organizations make important, tangible contributions on key challenges facing the nation: poor educational outcomes, low female workforce participation, the erosion of the rule of law and checks and balances, the lack of ethnic and social tolerance, and the need to care for Syrian refugees. While it is difficult to be optimistic about the rule of law and checks and balances in Turkey given the present circumstances, there are normative and economic reasons to support renewed reform. Foreign direct investment tends to flow to countries with enshrined legal protections and political checks.87 This also has been an area of priority investment for external funders of Turkish civil society such as the European Union and the United States. The Checks and Balances Network is one of the products of this need and this investment. Active in nine provinces, the group is designed to play down political divisions among its constituent groups; the platform has spent four years building trust among participants and focusing on communicating cohesively the overarching public interest in ensuring checks and balances in the political system. As mentioned previously, civil society participation can reduce polarization and increase integration and tolerance within society—highly relevant given the ethnic, sectarian, and political divides and low levels of public trust in Turkey. Civil society groups are not only forces for social cohesion, of course; they are also advocates for disadvantaged communities and groups that continue to face discrimination, including Kurds, Alevi, Roma, and the LGBTQ community. The Human Rights Association and Human Rights Foundation have already been mentioned, and their work has helped transform the discourse around the Kurdish conflict, despite the recent deterioration. NGOs have had success; for example, the Cem Foundation’s persistent legal challenges—and eventual appeals to the European Court of Human Rights—to secure legal recognition of Alevi Cem Houses as official places of worship, though implementation is still lagging.88 In both protecting at-risk groups and advancing social cohesion, civil society groups have much to offer. In many ways, the Syrian refugee crisis may prove the biggest long-term challenge for Turkey, and civil society has risen to the task thus far. Caring for and integrating this huge and extremely young population without triggering a backlash from Turkish citizens angry about the burdens on the state or the social changes brought by the influx will require close state cooperation with CSOs. Long-term integration in the community is particularly challenging because it cuts across many different policy areas, including humanitarian support, housing, education, and labor market reforms, to name a few. The issue of labor participation is especially tricky in the context of high Turkish unemployment, yet it is essential if Turkey is to avoid creating new structures of exploitation or marginalization. Civil society’s role in mitigating the Syrian refugee crisis in Turkey must be in both service provision and in monitoring the government’s response. There are numerous CSOs—both Turkish and international—doing impressive work to address the Syrian crisis. Despite criticism of its ties to the government and its wider policy positions, IHH is generally praised for its humanitarian assistance to Syrians fleeing the war. Another standout is Support to Life, a Turkish group whose effective humanitarian support has helped change the government’s perception of CSO capacity and value. Indeed, in the context of Turkish steps to limit international NGOs’ ability to operate in Turkey with respect to the Syrian crisis—an ominous and unproductive step—groups such as Support to Life may represent a politically acceptable compromise solution in the face of Ankara’s extreme political sensitivity surrounding the Syrian crisis. In short, across each of these priority policy areas, civil society groups are making important contributions. Additionally, in each of these areas there are moral and interest-based socioeconomic reasons to support those contributions. How then should Turkey, Europe, and the United States go about aiding the further development of Turkish civil society to best address the challenges facing the country and to repair its relations with the West? Turkish civil society groups—particularly those in opposition to the prevailing political currents in Turkey—will need ongoing support from both inside and outside the country to survive the current repressive environment. For Turkish institutions and individuals devoted to encouraging civic activism, navigating political and legal minefields can be difficult. For outside donors, particularly the European Union and the United States, support for Turkish civil society groups can bring advantages and risks, and can too often be used as political leverage in bilateral relations. What follows are some recommendations for how to operate in this context. As mentioned at the beginning of the report, external support to Turkish civil society should be conducted transparently and in keeping with the normative framework justifying such assistance and the laws of Turkey. Civil society activity accelerated in the 1990s and early 2000s alongside a parallel rise of explicit identity politics; both trends were reflections of the loosening of strict taboos on ethnic and religious sectarianism mandated by the Republican state.89 But civil society now threatens to be swallowed up by the forces that initially supported its expansion: Fragmentation along ideological and identity fault lines is among the biggest challenges facing the sector today. Alongside this fragmentation, the other fundamental challenge is, of course, the state and its restrictions. Overall, alongside a relaxation of restrictions on civil society activity, what is needed most is clarity from the Turkish government. Along with these two overarching challenges, increasing digital capacity and domestic funding capacity for civil society provide near-term opportunities. Improving connections between civil society organizations will not be easy, given how ideological and narrowly defined many groups are—for example, Sunni Muslim religious groups, ethnic Kurdish groups, and leftist political groups. But these divisions are part of the reason civil society groups are not seen as credible representatives of the people, nor a source of real alternatives for pressing social and political problems. Focusing more on cooperative structures and platforms, as well as rhetorical shifts to emphasize the overarching public interest rather than the narrow effects on parochial interests, could help in this regard. Equally, studies show that many of the people who participated in the Gezi Park protests or post-coup democracy rallies were not civil society activists. In fact, there was a big gap between formal civil society and these mass movements. This shows the need to improve the connections of CSOs with grassroots constituencies. One way to do this is to focus on crafting narratives that connect abstract rights with peoples’ daily lives, or that highlight civil society’s tangible work for society.90 Improved digital communications will also help to disseminate these stories. There is likewise a need to develop local fundraising and funding capacity to reduce reliance on foreign funding, especially given the difficulty of mobilizing in a highly regulated society and the divides that prevent many cooperative alliances within civil society. While there are a few existing grant-making foundations tied to the large conglomerates and wealthy individuals, this space needs further encouragement. Loosening the restrictions on fundraising and expanding digital fundraising capacity will help with both domestic funding and grassroots engagement. Political realities within Turkey mean that the reforms outlined above—along with a more generalized loosening of government enforcement—are unlikely in the near term. That leaves Turkish civil society substantially reliant on international support and funding. Before diving into the specifics of EU and U.S. cases, some general points about international funding and support are merited. Transnational funding sources can empower civil society groups. Those who know how to write grants can get funding free of some sources of local pressure, and appeals to international allies can at times deter the more open forms of government intervention—though this is becoming less true—for fear of international embarrassment. But while outside connections and support can help some organizations maintain their independence, these connections can also be attacked by domestic populists and nationalists, who lash out at Turkish citizens who work with foreign funders as being somehow unpatriotic, foreign, or part of some sort of imperialist project. But in such a repressive environment, these concerns pale in comparison with the simple need to keep the most at-risk organizations—those focused on political freedoms, freedom of expression, and human rights—open and functioning. While the same sorts of organizations that tend to be targeted by the government and are often the very ones deserving of continued support, international funders would do well to work to diversify the scope of the organizations they fund; interviewees said funding often goes to the same organizations or very similar groups, limiting the diversity of the field and leading to groups reshaping their mission or strategy to meet international donor priorities. Respondents also called on international funders to diversify the types of projects funded, saying that Turkish civil society groups often provide trainings because trainings get funded, but that their real impact was unclear and that the sector had moved beyond that aspect of capacity building. Turkish CSOs could use support strengthening their ability to collect and analyze data, which can allow both evidence-based activities and increased transparency. For donors operating in Turkey, meanwhile, coordination remains an area for improvement. The EU’s concerted, long-term effort to develop and strengthen Turkish civil society has been essential to the sector’s growth, and the wider EU accession process has been crucial to the overall improvement—until recently—of the environment for civic actors and political freedom writ large. This success—and the acknowledged importance of civil society to Turkey’s democratic development and EU accession—have led to achievements too numerous to capture here. Since 2008, the EU’s Civil Society Facility has provided direct grants to democracy promoters in Turkey, and the EU has consistently increased direct support to civil society—independent of the Turkish government—through the European Instrument for Democracy, human rights funding instruments, and other funding streams for accession countries. University exchanges and collective research projects—Turkey is fully integrated into EU research schemes—have had large and long-term effects. Civil society organizations, trade unions, and media have exchanged training and funding, establishing lasting partnerships. Indeed, while these recommendations focus on formal EU support for Turkish civil society, European CSOs and private funders have far more leeway to build this connective tissue while remaining somewhat insulated from government restrictions and high-level political pressure. One major challenge for the EU is to broaden its civil society engagement beyond its traditional partners, which are often concentrated in major urban centers and drawn from populations predisposed to support European values and integration. It will not be easy for the EU to reach new sectors of Turkish society given the political and social gap that today divides conservative Turkey and Europe. Progress might be aided by focusing on issues that are pertinent to Turkey’s economic situation and accepting the fact that mere participation can have a galvanizing and trust-building effect. If funding streams remain constant, the EU might even consider outside-the-box options such as targeted advertisements or public awareness campaigns to broaden its civil society interactions beyond traditional partners. Given this fundamental high-level political disagreement and the leverage the EU has with Turkey thanks to large its large financial assistance programs and deep economic ties, one approach would be to pursue a high-level compromise agreement, or so-called “grand bargain,” on this set of issues. The exact contents of this deal would need to be negotiated, of course, but in the civil society context the EU could call for the reforms presented in the section above on Turkish support for civil society; international monitoring access to Kurdish areas of the country; an end to the harassment of foreign CSOs, particularly those working on the Syrian refugee crisis; a lifting of the state of emergency; and meaningful legal recourse for those swept up in the post-coup purges. These items would likely be accompanied by items related to the overall political situation—such as the release of HDP parliamentarians—that fall outside the purview of this report. In exchange, the EU would deliver the promised refugee-related assistance and pledge additional funds, consider routing new funds through Turkish state bodies, continue IPA funding streams, and possibly begin negotiations to update the customs union—with the deal to be introduced through phased compliance. The U.S.-Turkey relationship is perhaps the worst it has been since the arms embargo of 1975–1978. The domestic U.S. political environment for foreign assistance—let along civil society support—is also perhaps the worst it has been since the end of the Cold War. Unlike EU-Turkey relations, civil society interactions are unlikely to be a major player in high-level political interactions between the United States and Turkey, given the litany of strategic issues that dominate the bilateral relationship. While the EU completely eclipses the United States in terms of its economic ties to Turkey and its financial investments in supporting Turkish civil society—there is very little U.S. funding for such activities—the U.S. relationship is symbolically very important in the context of Turkish civil society and overall rights and freedoms. Furthermore, Turkey and the EU are unlikely to reach high-level political understanding absent U.S. engagement and pressure; this has often been a pattern in Turkey’s relations with Europe. Interviewees for this report unanimously called for greater U.S. engagement in supporting Turkish civil society, and highlighted the need to build ties between U.S. and Turkish civil society groups. The Legislative Fellows Program at the U.S. Department of State—which has brought 60 Turkish citizens to the United States over the past five years to learn through stints at relevant U.S. institutions, though not all fellows are civil society activists—is one rare systematic example of these exchanges. Travel is often a selling point for Turkish participants, along with the prestige of a U.S. fellowship or training program. Just bringing sometimes-beleaguered activists to the United States for a break from Turkey’s fraught politics can prove useful, but U.S. civil society organizations also have much to offer on the priority areas outlined above. U.S. groups can and should bring Turkish civic actors to learn techniques of policy advocacy, communications, grassroots lobbying, and digital mobilization and fundraising. In terms of travel and communications, mobilization, and fundraising improvements, exchanges need not be governmental—U.S. CSOs with ties to Turkey can and should lead this effort, potentially sidestepping the thornier issue of U.S. government involvement. Turkey is just one part of a “global crisis of liberalism” that has brought with it a global erosion of civil society freedom and new legal and extra-legal efforts to suppress civic activity and democratic participation, part of a global “democratic recession.”111 Likewise, civil society is increasingly contending with an erosion of public trust, part of overall decrease in trust in institutions. The health of civil society depends, in part, on finding ways to reconstitute and restore overall societal trust. In Turkey’s case, a sustained political crisis has left the country deeply polarized, increasing this need for revitalizing social trust. Polarization is nothing new in Turkey, but the recent deterioration is dramatic when set against the improvement from the late 1990s to the late 2000s. The Syrian refugee crisis, renewed Kurdish conflict, and the July 2016 coup attempt have led to increased social fragmentation and a dramatic deterioration in state capacity—accompanied, paradoxically, by severe repression. On each of these fronts, civil society offers meaningful capacity and should be supported. For the West, civil society remains a way to productively engage Turkey at a time when high-level political relations are at a nadir. For both the European Union and the United States, broadening engagement to include issues that are both normative and pertinent to Turkey’s economic situation—such as rule of law, educational reform, and women’s participation—could be productive. If the Turkish government continues down a course of repression and majoritarianism, the United States and the EU may eventually face difficult choices around whether to impose meaningful conditionality on their support for Turkey and whether to formally change the status of bilateral relations. Turkey is unlikely to be a reliable partner over the long term absent renewed democratic progress or, at a minimum, a decrease in political, ethnic, and social tension. This reality leaves support for civil society—in the hope of preserving the connective tissue that binds Turkey to the West and has incentivized halting democratic reform—as one of the few remaining areas of productive engagement. The authors are indebted to many people in Turkey, Europe, and the United States for lending their help and expertise to this project. In addition to the Turkey 2023 Task Force and the civil society expert working group, listed below, we would like to thank Stiftung Mercator, the Istanbul Policy Center, and the Istituto Affari Internazionale for their support and cooperation in this collaborative project. In addition, the authors would like to thank the many civil society experts and practitioners, listed and anonymous, who lent their time and expertise to us during the research process.